28 October/November 2018 unmanned systems inside GROUND INNOVATIONS them to better meet the community's needs. Driverless delivery also offers ben- efits for people who have difficulty leaving their homes, whether it's a sin- gle mom trying to care for a sick child or someone with a disability who isn't able to drive. Both Susan and Hank Binkowski also see a variety of other industries offering this service for their customers, including pharmacies to deliver medicine. "In the past having stores open 24 hours a day to serve all the different demographics was commonplace," Susan Binkowski said. "With these ve- hicles, you don't have to keep an entire store open for everybody, but we theo- retically can have groceries delivered at any time and any place." And of course there's convenience for your typical customers. Rather than jumping in their car and heading to the store for their groceries, they can order them on an app and know they'll arrive in a secure vehicle. This is also benefi- cial when ordering parcels, Gasanyan said, noting Delivery Guys also works closely with Amazon. Items will be brought to you wherever you are at a time that you choose. Customers won't have to worry about packages being stolen if they are left at their doorstep, and they'll never come home to a "sorry we missed you note" from a delivery driver ever again. "Self-driving vehicles can transform cities in numerous ways, including providing an affordable and accessible transportation and delivery option, as well as being a part of the larger solution to solve mobility and congestion issues to help people move more freely," Wolf said. "With a self-driving delivery service, packages will be able to move faster and not able to retrieve the groceries them- selves or they just prefer more tradi- tional options. And, at least for now, the cars can't deliver goods without a safety operator. By law, Gasanyan isn't able to keep drivers on the road for more than 10 hours, he said. That isn't an issue with an autonomous vehicle. These vehicles can stay on the road for 24 hours, even making night delivery possible. So in- stead of splitting a 12-hour shift be- tween two drivers, he can use a driver- less car for the entire shift or to finish the night portion of the route. There's plenty of pressure on drivers to quickly finish deliveries so they can move on to the next one, and autonomous ve- hicles can help alleviate some of that, said Daniel Reiss, the project director of Home Delivery World, where Susan Binkowski first saw the Udelv ADV. "We're also able to deliver in places where we can have the vehicle show up and act as a mobile locker," Gasanyan said. "It can sit in one place without straining the driver or having the driver sit there idle. The car arrives in a parking lot where someone is expecting a pack- age and stays there until the customer arrives. 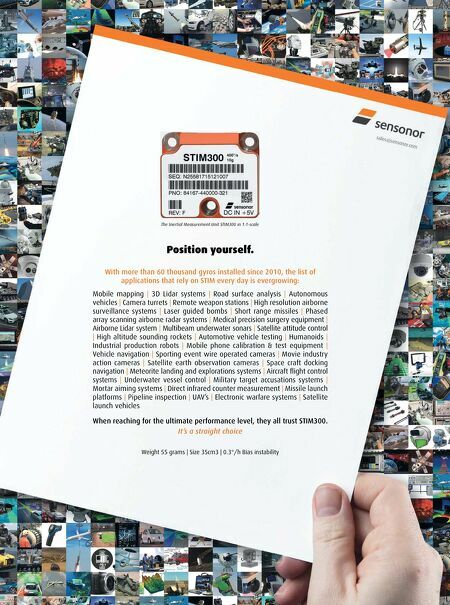 There are a lot of applications on our side that will save us time and effort." Autonomous delivery also can help small, local businesses grow, Wolf said. "A self-driving delivery service could help a small business that might not be able to afford a dedicated delivery vehicle or a medium-sized business that may have an underused vehicle that is a financial burden," Wolf said. "These businesses could choose to use Ford's self-driving business f leet instead, which can also allow them to apply human resources to other parts of the business." " If you look at history, everything always started with freight. Vehicles carried freight before people. Elevators carried freight before people. All these things just carried products first. I think that's a really good way to look at this as an industry. The only risk is stu•." 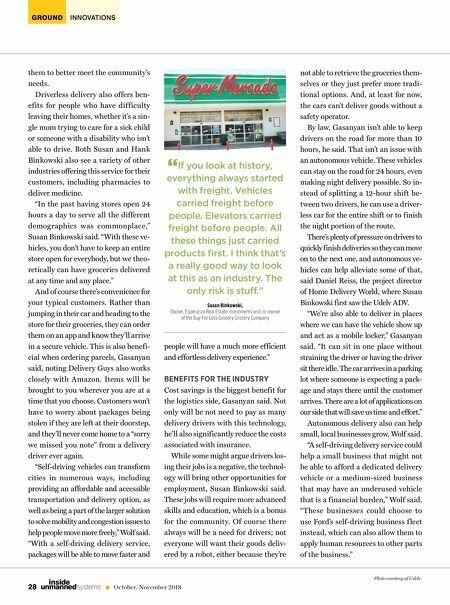 Susan Binkowski, Owner, Esperanza Real Estate Investments and co-owner of the Buy For Less Grocery Grocery Company people will have a much more efficient and effortless delivery experience." BENEFITS FOR THE INDUSTRY Cost savings is the biggest benefit for the logistics side, Gasanyan said. Not only will he not need to pay as many delivery drivers with this technology, he'll also significantly reduce the costs associated with insurance. While some might argue drivers los- ing their jobs is a negative, the technol- ogy will bring other opportunities for employment, Susan Binkowski said. These jobs will require more advanced skills and education, which is a bonus for the community. Of course there always will be a need for drivers; not everyone will want their goods deliv- ered by a robot, either because they're Photo courtesy of Udelv.